Why are Wedding Sparklers Popular? Showering the bride and groom with paper confetti and streamers replaced the traditional rice shower many years ago, as a way to celebrate their marriage. One of the bigger problems with both items is that someone always needs to clean up afterward. In recent years, sparklers have become an extremely popular option and are quickly replacing confetti, streamers, rice, or even rose petals. More than just eliminating clean-up duty, there are several reasons why couples, family members, and even wedding planners are now buying wedding sparklers online. Although most weddings are held during daylight hours, the average wedding reception can last far into the night. Even if you have managed to shower the bride and groom at the church, you still need a great way to send them off to their honeymoon from the reception. Things like flower petals and confetti can’t really be seen in the dark. But sparklers will light up the night and can be used to create an amazing tunnel of light to send them on their way. Traditional weddings are no longer quite as popular as they once were with many couples choosing to have their wedding and reception in the same location. Rice has been found to be hazardous to a number of birds and animals as the grains can end up in their eyes or causing a choking hazard. Rice can also damage a human being's eyes, especially when they are being pelted with large handfuls at a time. Sparklers are safer as the only part of them that could cause injury is the stick itself. Many churches and event facilities stopped allowing people to throw rice or confetti at weddings for one simple reason: they both leave an incredible mess that someone must clean up. Some wedding couples have tried things like bubbles but found their guests to be too busy blowing bubbles to enjoy watching the bride and groom depart, let alone have enough air left to say goodbye and offer their congratulations. The only thing left over from wedding sparklers are the sticks and all of these should be in a single bucket that can easily be disposed of. Wedding sparklers are available in a wide range of sizes, shapes, and colors. They burn longer than the sparklers you buy online for the 4th of July or New Year’s. Imagine creating a tunnel of sparklers that showers the bride and groom in gold colored sparks as they wend their way from the reception to the car that will take them off on their honeymoon. What could be more romantic? At Wedding Sparklers Outlet, we offer a wide selection of wedding sparklers online ranging in size from 10 to 36 inches. 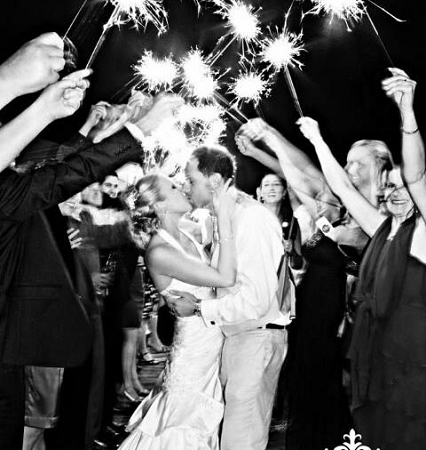 We also offer heart shaped sparklers for the ultimate romantic wedding. If your wedding is coming up, why not do away with the traditional rice and make sure all of your guests have sparklers to send you on your way?